For the boundary between computer systems, see Interface (computing). For other uses, see Interface (disambiguation). Example of a tangible user interface. The user interface (UI), in the industrial design field of human–machine interaction, is the space where interactions between humans and machines occur. The goal of this interaction is to allow effective operation and control of the machine from the human end, whilst the machine simultaneously feeds back information that aids the operators' decision-making process. Examples of this broad concept of user interfaces include the interactive aspects of computer operating systems, hand tools, heavy machinery operator controls, and process controls. The design considerations applicable when creating user interfaces are related to or involve such disciplines as ergonomics and psychology. Generally, the goal of user interface design is to produce a user interface which makes it easy (self-explanatory), efficient, and enjoyable (user-friendly) to operate a machine in the way which produces the desired result. This generally means that the operator needs to provide minimal input to achieve the desired output, and also that the machine minimizes undesired outputs to the human. 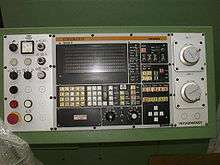 With the increased use of personal computers and the relative decline in societal awareness of heavy machinery, the term user interface is generally assumed to mean the graphical user interface, while industrial control panel and machinery control design discussions more commonly refer to human-machine interfaces. Other terms for user interface are man–machine interface (MMI) and when the machine in question is a computer human–computer interface. 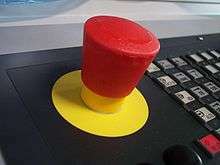 A graphical user interface following the desktop metaphor. The user interface or human–machine interface is the part of the machine that handles the human–machine interaction. Membrane switches, rubber keypads and touchscreens are examples of the physical part of the Human Machine Interface which we can see and touch. 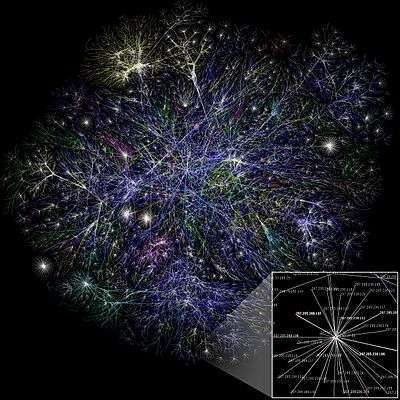 In complex systems, the human–machine interface is typically computerized. 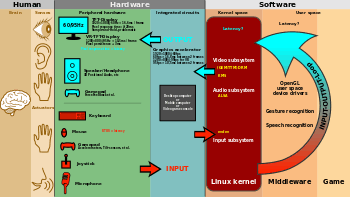 The term human–computer interface refers to this kind of system. In the context of computing the term typically extends as well to the software dedicated to control the physical elements used for human-computer interaction. The engineering of the human–machine interfaces is enhanced by considering ergonomics (human factors). The corresponding disciplines are human factors engineering (HFE) and usability engineering (UE), which is part of systems engineering. Tools used for incorporating human factors in the interface design are developed based on knowledge of computer science, such as computer graphics, operating systems, programming languages. 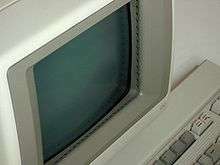 Nowadays, we use the expression graphical user interface for human–machine interface on computers, as nearly all of them are now using graphics. 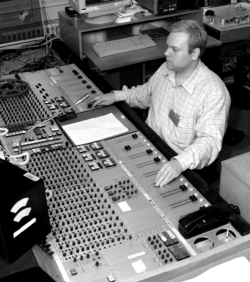 A human–machine interface usually involves peripheral hardware for the INPUT and for the OUTPUT. Often, there is an additional component implemented in software, like e.g. a graphical user interface. There is a difference between a user interface and an operator interface or a human–machine interface (HMI). Where a network of equipment or computers are interlinked through an MES (Manufacturing Execution System)-or Host to display information. An HMI is typically local to one machine or piece of equipment, and is the interface method between the human and the equipment/machine. An operator interface is the interface method by which multiple equipment that are linked by a host control system is accessed or controlled. The system may expose several user interfaces to serve different kinds of users. For example, a computerized library database might provide two user interfaces, one for library patrons (limited set of functions, optimized for ease of use) and the other for library personnel (wide set of functions, optimized for efficiency). The user interface of a mechanical system, a vehicle or an industrial installation is sometimes referred to as the human–machine interface (HMI). 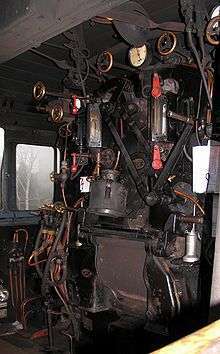 HMI is a modification of the original term MMI (man-machine interface). In practice, the abbreviation MMI is still frequently used although some may claim that MMI stands for something different now. Another abbreviation is HCI, but is more commonly used for human–computer interaction. Other terms used are operator interface console (OIC) and operator interface terminal (OIT). However it is abbreviated, the terms refer to the 'layer' that separates a human that is operating a machine from the machine itself. Without a clean and usable interface, humans would not be able to interact with information systems. 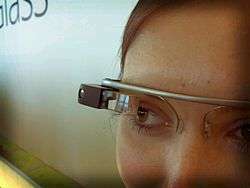 In science fiction, HMI is sometimes used to refer to what is better described as direct neural interface. However, this latter usage is seeing increasing application in the real-life use of (medical) prostheses—the artificial extension that replaces a missing body part (e.g., cochlear implants). In some circumstances, computers might observe the user and react according to their actions without specific commands. A means of tracking parts of the body is required, and sensors noting the position of the head, direction of gaze and so on have been used experimentally. This is particularly relevant to immersive interfaces. In the batch era, computing power was extremely scarce and expensive. User interfaces were rudimentary. 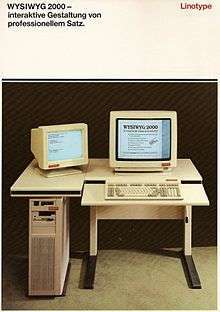 Users had to accommodate computers rather than the other way around; user interfaces were considered overhead, and software was designed to keep the processor at maximum utilization with as little overhead as possible. 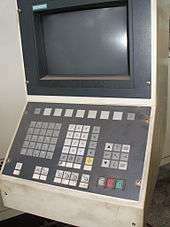 The input side of the user interfaces for batch machines were mainly punched cards or equivalent media like paper tape. The output side added line printers to these media. With the limited exception of the system operator's console, human beings did not interact with batch machines in real time at all. Submitting a job to a batch machine involved, first, preparing a deck of punched cards describing a program and a dataset. 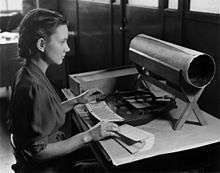 Punching the program cards wasn't done on the computer itself, but on keypunches, specialized typewriter-like machines that were notoriously balky, unforgiving, and prone to mechanical failure. The software interface was similarly unforgiving, with very strict syntaxes meant to be parsed by the smallest possible compilers and interpreters. Once the cards were punched, one would drop them in a job queue and wait. Eventually. operators would feed the deck to the computer, perhaps mounting magnetic tapes to supply another dataset or helper software. The job would generate a printout, containing final results or (all too often) an abort notice with an attached error log. Successful runs might also write a result on magnetic tape or generate some data cards to be used in later computation. The turnaround time for a single job often spanned entire days. If one were very lucky, it might be hours; real-time response was unheard of. But there were worse fates than the card queue; some computers actually required an even more tedious and error-prone process of toggling in programs in binary code using console switches. The very earliest machines actually had to be partly rewired to incorporate program logic into themselves, using devices known as plugboards. Early batch systems gave the currently running job the entire computer; program decks and tapes had to include what we would now think of as operating system code to talk to I/O devices and do whatever other housekeeping was needed. Midway through the batch period, after 1957, various groups began to experiment with so-called “load-and-go” systems. These used a monitor program which was always resident on the computer. Programs could call the monitor for services. Another function of the monitor was to do better error checking on submitted jobs, catching errors earlier and more intelligently and generating more useful feedback to the users. Thus, monitors represented a first step towards both operating systems and explicitly designed user interfaces. Command-line interfaces (CLIs) evolved from batch monitors connected to the system console. Their interaction model was a series of request-response transactions, with requests expressed as textual commands in a specialized vocabulary. Latency was far lower than for batch systems, dropping from days or hours to seconds. Accordingly, command-line systems allowed the user to change his or her mind about later stages of the transaction in response to real-time or near-real-time feedback on earlier results. Software could be exploratory and interactive in ways not possible before. But these interfaces still placed a relatively heavy mnemonic load on the user, requiring a serious investment of effort and learning time to master. 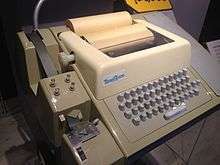 The earliest command-line systems combined teleprinters with computers, adapting a mature technology that had proven effective for mediating the transfer of information over wires between human beings. Teleprinters had originally been invented as devices for automatic telegraph transmission and reception; they had a history going back to 1902 and had already become well-established in newsrooms and elsewhere by 1920. In reusing them, economy was certainly a consideration, but psychology and the Rule of Least Surprise mattered as well; teleprinters provided a point of interface with the system that was familiar to many engineers and users. 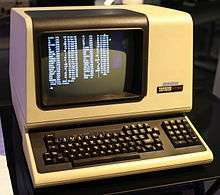 The widespread adoption of video-display terminals (VDTs) in the mid-1970s ushered in the second phase of command-line systems. These cut latency further, because characters could be thrown on the phosphor dots of a screen more quickly than a printer head or carriage can move. They helped quell conservative resistance to interactive programming by cutting ink and paper consumables out of the cost picture, and were to the first TV generation of the late 1950s and 60s even more iconic and comfortable than teleprinters had been to the computer pioneers of the 1940s. Just as importantly, the existence of an accessible screen — a two-dimensional display of text that could be rapidly and reversibly modified — made it economical for software designers to deploy interfaces that could be described as visual rather than textual. The pioneering applications of this kind were computer games and text editors; close descendants of some of the earliest specimens, such as rogue(6), and vi(1), are still a live part of Unix tradition. In 1985, with the beginning of Microsoft Windows and other graphical user interfaces, IBM created what is called the Systems Application Architecture (SAA) standard which include the Common User Access (CUA) derivative. CUA successfully created what we know and use today in Windows, and most of the more recent DOS or Windows Console Applications will use that standard as well. This defined that a pulldown menu system should be at the top of the screen, status bar at the bottom, shortcut keys should stay the same for all common functionality (F2 to Open for example would work in all applications that followed the SAA standard). This greatly helped the speed at which users could learn an application so it caught on quick and became an industry standard. 1968 – Douglas Engelbart demonstrated NLS, a system which uses a mouse, pointers, hypertext, and multiple windows. 1985 – Windows 1.0 – provided GUI interface to MS-DOS. No overlapping windows (tiled instead). 1986 – Apple threatens to sue Digital Research because their GUI desktop looked too much like Apple's Mac. Primary methods used in the interface design include prototyping and simulation. Common practices for prototyping are based on interactive design based on libraries of interface elements (controls, decoration, etc.). Clarity The interface avoids ambiguity by making everything clear through language, flow, hierarchy and metaphors for visual elements. Concision It's easy to make the interface clear by over-clarifying and labeling everything, but this leads to interface bloat, where there is just too much stuff on the screen at the same time. If too many things are on the screen, finding what you're looking for is difficult, and so the interface becomes tedious to use. The real challenge in making a great interface is to make it concise and clear at the same time. Familiarity Even if someone uses an interface for the first time, certain elements can still be familiar. Real-life metaphors can be used to communicate meaning. Responsiveness A good interface should not feel sluggish. This means that the interface should provide good feedback to the user about what's happening and whether the user's input is being successfully processed. Consistency Keeping your interface consistent across your application is important because it allows users to recognize usage patterns. Aesthetics While you don't need to make an interface attractive for it to do its job, making something look good will make the time your users spend using your application more enjoyable; and happier users can only be a good thing. Efficiency Time is money, and a great interface should make the user more productive through shortcuts and good design. Forgiveness A good interface should not punish users for their mistakes but should instead provide the means to remedy them. The principle of least astonishment (POLA) is a general principle in the design of all kinds of interfaces. It is based on the idea that human beings can only pay full attention to one thing at one time, leading to the conclusion that novelty should be minimized. Direct manipulation interface is the name of a general class of user interfaces that allow users to manipulate objects presented to them, using actions that correspond at least loosely to the physical world. Graphical user interfaces (GUI) accept input via devices such as a computer keyboard and mouse and provide articulated graphical output on the computer monitor. There are at least two different principles widely used in GUI design: Object-oriented user interfaces (OOUIs) and application oriented interfaces. Touchscreens are displays that accept input by touch of fingers or a stylus. Used in a growing amount of mobile devices and many types of point of sale, industrial processes and machines, self-service machines etc. Command line interfaces, where the user provides the input by typing a command string with the computer keyboard and the system provides output by printing text on the computer monitor. Used by programmers and system administrators, in engineering and scientific environments, and by technically advanced personal computer users. Touch user interface are graphical user interfaces using a touchpad or touchscreen display as a combined input and output device. They supplement or replace other forms of output with haptic feedback methods. Used in computerized simulators etc. Hardware interfaces are the physical, spatial interfaces found on products in the real world from toasters, to car dashboards, to airplane cockpits. They are generally a mixture of knobs, buttons, sliders, switches, and touchscreens. Attentive user interfaces manage the user attention deciding when to interrupt the user, the kind of warnings, and the level of detail of the messages presented to the user. Batch interfaces are non-interactive user interfaces, where the user specifies all the details of the batch job in advance to batch processing, and receives the output when all the processing is done. The computer does not prompt for further input after the processing has started. Conversational interfaces enable users to command the computer with plain text English (e.g., via text messages, or chatbots) or voice commands, instead of graphic elements. These interfaces often emulate human-to-human conversations. Conversational interface agents attempt to personify the computer interface in the form of an animated person, robot, or other character (such as Microsoft's Clippy the paperclip), and present interactions in a conversational form. Crossing-based interfaces are graphical user interfaces in which the primary task consists in crossing boundaries instead of pointing. Gesture interfaces are graphical user interfaces which accept input in a form of hand gestures, or mouse gestures sketched with a computer mouse or a stylus. Holographic user interfaces provide input to electronic or electro-mechanical devices by passing a finger through reproduced holographic images of what would otherwise be tactile controls of those devices, floating freely in the air, detected by a wave source and without tactile interaction. Intelligent user interfaces are human-machine interfaces that aim to improve the efficiency, effectiveness, and naturalness of human-machine interaction by representing, reasoning, and acting on models of the user, domain, task, discourse, and media (e.g., graphics, natural language, gesture). Motion tracking interfaces monitor the user's body motions and translate them into commands, currently being developed by Apple. Multi-screen interfaces, employ multiple displays to provide a more flexible interaction. 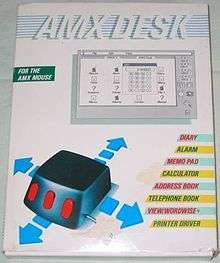 This is often employed in computer game interaction in both the commercial arcades and more recently the handheld markets. Non-command user interfaces, which observe the user to infer his / her needs and intentions, without requiring that he / she formulate explicit commands. Object-oriented user interfaces (OOUI) are based on object-oriented programming metaphors, allowing users to manipulate simulated objects and their properties. Reflexive user interfaces where the users control and redefine the entire system via the user interface alone, for instance to change its command verbs. Typically this is only possible with very rich graphic user interfaces. Search interface is how the search box of a site is displayed, as well as the visual representation of the search results. 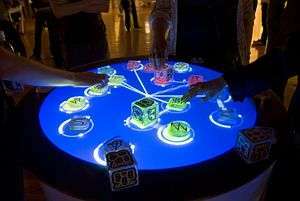 Tangible user interfaces, which place a greater emphasis on touch and physical environment or its element. Task-focused interfaces are user interfaces which address the information overload problem of the desktop metaphor by making tasks, not files, the primary unit of interaction. Text-based user interfaces are user interfaces which output a text. TUIs can either contain a command-line interface or a text-based WIMP environment. 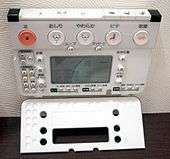 Voice user interfaces, which accept input and provide output by generating voice prompts. The user input is made by pressing keys or buttons, or responding verbally to the interface. Natural-language interfaces – Used for search engines and on webpages. User types in a question and waits for a response. Zero-input interfaces get inputs from a set of sensors instead of querying the user with input dialogs. Zooming user interfaces are graphical user interfaces in which information objects are represented at different levels of scale and detail, and where the user can change the scale of the viewed area in order to show more detail. Ncurses, a semigraphical user interface. ↑ Griffin, Ben; Baston, Laurel. "Interfaces" (Presentation): 5. Retrieved 7 June 2014. The user interface of a mechanical system, a vehicle or an industrial installation is sometimes referred to as the human-machine interface (HMI). 1 2 3 4 "User Interface Design and Ergonomics" (PDF). COURSE CIT 811. NATIONAL OPEN UNIVERSITY OF NIGERIA: SCHOOL OF SCIENCE AND TECHNOLOGY: 19. Retrieved 7 June 2014. In practice, the abbreviation MMI is still frequently used although some may claim that MMI stands for something different now. ↑ Cipriani, Christian; Segil, Jacob; Birdwell, Jay; Weir, Richard. "Dexterous control of a prosthetic hand using fine-wire intramuscular electrodes in targeted extrinsic muscles". IEEE Transactions on Neural Systems and Rehabilitation Engineering: 1–1. doi:10.1109/TNSRE.2014.2301234. ISSN 1534-4320. Neural co-activations are present that in turn generate significant EMG levels and hence unintended movements in the case of the present human machine interface (HMI). ↑ Citi, Luca (2009). "Development of a neural interface for the control of a robotic hand" (PDF). Scuola Superiore Sant'Anna, Pisa, Italy: IMT Institute for Advanced Studies Lucca: 5. Retrieved 7 June 2014. ↑ Jordan, Joel. "Gaze Direction Analysis for the Investigation of Presence in Immersive Virtual Environments" (Thesis submitted for the degree of Doctor of Philosophy). University of London: Department of Computer Science: 5. Retrieved 7 June 2014. The aim of this thesis is to investigate the idea that the direction of gaze may be used as a device to detect a sense-of-presence in Immersive Virtual Environments (IVE) in some contexts. ↑ Ravi (August 2009). "Introduction of HMI". Retrieved 7 June 2014. In some circumstance computers might observe the user, and react according to their actions without specific commands. A means of tracking parts of the body is required, and sensors noting the position of the head, direction of gaze and so on have been used experimentally. This is particularly relevant to immersive interfaces. ↑ Richard, Stéphane. "Text User Interface Development Series Part One - T.U.I. Basics". Retrieved 13 June 2014. 1 2 3 McCown, Frank. "History of the Graphical User Interface (GUI)". Harding University. ↑ Raymond, Eric Steven (2003). "11". The Art of Unix Programming. Thyrsus Enterprises. Retrieved 13 June 2014. ↑ C. A. D'H Gough; R. Green; M. Billinghurst. "Accounting for User Familiarity in User Interfaces" (PDF). Retrieved 13 June 2014. ↑ Sweet, David (October 2001). "9 - Constructing A Responsive User Interface". KDE 2.0 Development. Sams Publishing. Retrieved 13 June 2014. ↑ John W. Satzinger; Lorne Olfman (March 1998). "User interface consistency across end-user applications: the effects on mental models". Journal of Management Information Systems. Managing virtual workplaces and teleworking with information technology. Armonk, NY. 14 (4): 167–193. ↑ Raskin, Jef (2000). The human interface : new directions for designing interactive systems (1. printing. ed.). Reading, Mass. [u.a. ]: Addison Wesley. ISBN 0-201-37937-6. ↑ Gordana Lamb. "Improve Your UI Design Process with Object-Oriented Techniques". Visual Basic Developer magazine. 2001. quote: "Table 1. Differences between the traditional application-oriented and object-oriented approaches to UI design." ↑ Errett, Joshua. "As app fatigue sets in, Toronto engineers move on to chatbots". CBC. CBC/Radio-Canada. Retrieved July 4, 2016. Look up user interface in Wiktionary, the free dictionary. Wikimedia Commons has media related to User interfaces.